General Electric is losing its place on the Dow Jones Industrial Average after more than a century in a move that reflects its declining fortunes and a changing US economy. Walgreens Boots Alliance will take its spot on the financial index, which tracks shares of 30 companies deemed representative of the US economy. The change takes effect on 26 June. The firm that runs the index said the change was intended to reflect the growth of the healthcare sector. David Blitzer of S&P Dow Jones Indices said the change would make the Dow a "better measure of the economy and the stock market". The move follows a difficult period for General Electric, whose shares have more than halved in the past year. GE has replaced its chief executive and announced a series of cuts in an effort to reposition itself. GE said falling out of the Dow would not alter its commitment to creating a "stronger, simpler" company. One of the original companies included on the Dow, GE traces its roots to Thomas Edison's light bulb business founded in the 1890s. It became one of America's biggest companies - an industrial conglomerate that also owned the NBC Universal media company and operated a major finance division. Over the last decade, the firm has sold businesses including NBC, GE Capital and its appliances division, responding to losses triggered by the financial crisis and poor performance against competitors. 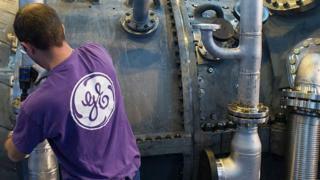 GE, which employs about 300,000 people globally, is seeking to offload its lightbulb business and last month sold its railroad division. The committee that oversees the Dow, which is run by a division of S&P Global, reviews the composition of the index regularly. It replaced AT&T with Apple in 2015. Walgreens, founded as a neighbourhood pharmacy in 1901, has been rapidly expanding in recent years. In 2012 it bought a stake in Alliance Boots and took full control two years later. The Illinois-based firm also acquired more than 1,900 stores from Rite-Aid last year.